As the Führer approached me – I was almost at the end of the line – my attention was caught by his nose. I had never noticed how broad and ill-proportioned this nose was. In profile, the little moustache was less distracting and the nose could be seen more clearly: it had a wide base and flat bridges, a little break in the bridge emphasised the tip; it was clearly a Slavonic or Bohemian nose, nearly Mongolo-Ostic. I don’t know why this detail fascinated me, but I found it almost scandalous. The Führer approached and I kept observing him. Then he was in front of me. I saw with surprise that his cap scarcely reached my eyes; and yet I am not tall. He muttered his compliment and groped for the medal. His foul, fetid breath overwhelmed me: it was too much to take. So I leaned forward and bit into his bulbous nose, drawing blood. Even today I would be unable to tell you why I did this: I just couldn’t restrain myself. The Führer let out a shrill cry and leaped back into Bormann’s arms. There was an instant when no one moved. Then several men lay into me. The effect of this passage is shocking to the reader, in part because up to this point (we are on page 960) everything that has happened has been feasible, if not historically authenticated; Max’s experience of the massacre at Babi Yar, the battle of Stalingrad, the shenanigans among the leadership, the ostracism of Speer by elements of the SS because he wanted to deploy concentration camp inmates as armaments factory workers rather than killing the lot – most everything is the book, other than the character of Max himself, is historically based: and then this marvellous touch, with Max biting Hitler’s nose. I was so surprised I nearly fell off my chair – Demay (or was it Demaine or Deraine?) who was ‘looking after me today’ in One Flew South, was discreet enough not to ask why it took me two hours to eat a portion of sushi – and I truly thought this was an audacious move on the novelist’s part, to have his character bite Hitler’s nose. After all this tension, the massive build up of suffering and terror and slaughter, to have the whole thing brought into close-up: the suggestion that Hitler was far from a perfect example of the Aryan race he sought to perpetuate; that indeed his proboscis indicated Slavic, possibly even more degenerate racial roots, was to Max, ‘scandalous’, serves to explode the tension in a surprisingly effective way. “Trevor-Roper, I know, never breathed a word about this episode, nor has Bullock, nor any of the historians who have studied the Führer’s last days. Yet it did take place, I assure you.” I will not reveal how Max manages to get himself out of this final indiscretion, but it is quite reasonable that he does: and by this point anyway, you just want to get to the end. 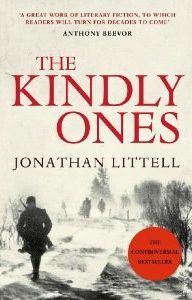 Reading Jonathan Littell’s book, however, knowing how slow a reader I am, and the amount of time it has taken me while I might usefully have been employed reading other things has helped bring me to a decision: that for the next year I will only be reading short fiction and poetry. I don’t know if I can stick to it but we’ll see. If nothing else, I will acquire a new acquaintanceship with the short story, which will be fun, and certainly less exhausting. But right now I must prepare some notes to deliver a talk to a hundred or so Mexican High School kids, on the theme of ‘How I became a writer’. Gulp. Why did I agree to this? I had the choice and could have said no. The truth is, I said it to accommodate the person who asked, at the time a distant and unknown Book Fair official. But what does it take to back out now? In future I think I will cultivate a Beckettian or Pynchonesque silence on matters of self-disclosure – not easy if one is the author of a ‘memoir’. Truly, why put oneself through this kind of thing? But then again, after The Kindly Ones, it’s bound to be a doddle.